One of our 2011 New Year’s resolutions was to go vegetarian for the first few months of the year. That ended on January 2, actually, really on January 1 when we took the deer roast out of the freezer to thaw. We do eat meat, and love it, but we also understand all the health and environmental issues associated with eating too much meat–extra weight, exposure to hormones and antibiotics, pollution and waste, the cruelty of CAFOS, etc. But in our defense, we received a cooler full of wild venison and pheasant meat compliments of Steve’s father and we found a great recipe from Cook’s Illustrated (CI) called “Really Good Pot Roast” that we wanted to try. Also, we’re foodies that like to eat, cook, and…well, there’s always next year. Pot roast and polenta. A good, stick to your ribs, Sunday dinner. 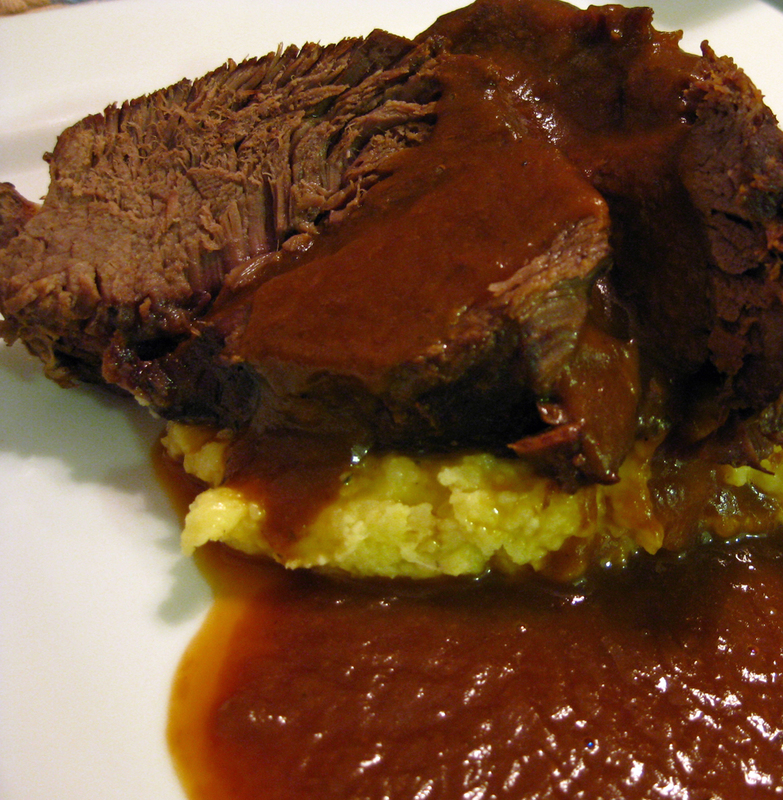 The CI recipe we found comes from their November/December 2010 magazine for Classic Pot Roast. We followed the recipe almost exactly with three minor (or major) modifications: we used a deer roast instead of the traditional beef roast; cranberry juice instead of red wine (we’re on the wagon for a few months); and we added a little soy sauce at the end to give it a little extra umami. The results were a mixed bag. While we liked the roast, it was falling apart when we cut into it and presentation wasn’t what we expected. It probably would have been better had we left it overnight in the fridge and then served it the next day, but then the question arose, “What should we have for dinner tonight?” We decided on the roast. It was served with a nice portion of polenta and a sauté of mustard greens. The dinner was great in spite of the roast being a bit too crumbly. The sauce though had an intense sweetness to it that would not have been there if we had just used wine. It wasn’t a bad flavor, just sweet. The soy sauce really helped give the sauce what it was missing. The next night, the roast really had its moment in the spotlight. We let the leftover roast sit in the sauce over night. The next day we shredded the roast and heated it with the sauce. 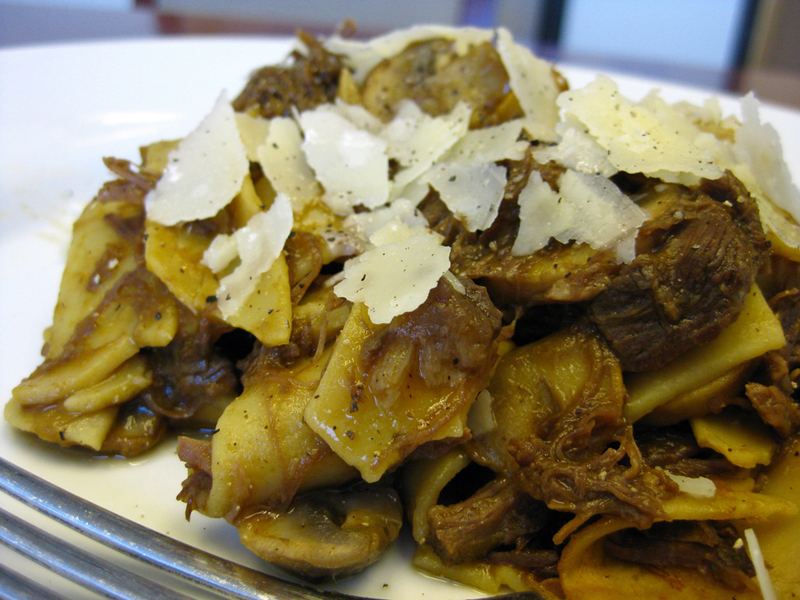 Using our favorite Trader Joe’s Pappardelle pasta as the base, we dressed the pasta with the warmed sauce. Incredible! Not only did it stretched our meat consumption by four more meals, it also made for a great sugo. We’ll definitely be making this roast again but instead of a traditional Sunday roast we’ll just use the shredded meat sauce and pasta. This way we still get our meat but not so much all at once. Pot roast: Before and after. 1. Sprinkle pieces of meat with 1 tablespoon salt (1½ teaspoons if using table salt), place on wire rack set in rimmed baking sheet, and let stand at room temperature 1 hour. 2. Adjust oven rack to lower-middle position and heat oven to 300 degrees. Heat butter in heavy-bottomed Dutch oven over medium heat. When foaming subsides, add onions and cook, stirring occasionally, until softened and beginning to brown, 8 to 10 minutes. Add carrot and celery; continue to cook, stirring occasionally, for 5 minutes longer. Add garlic and cook until fragrant, about 30 seconds. Stir in 1 cup broth, ½ cup wine (or juice), tomato paste, bay leaf, and thyme sprig; bring to simmer. 3. Pat beef dry with paper towels and season generously with pepper. Using 3 pieces of kitchen twine, tie each piece of meat into loaf shape for even cooking. 4. Nestle meat on top of vegetables. Cover pot tightly with large piece of foil and cover with lid; transfer pot to oven. Cook beef for three hours flipping halfway through cooking. Continue cooking until beef is fully tender and sharp knife easily slips in and out of meat, about 30 minutes to 1 hour. 5. Transfer roasts to cutting board and tent loosely with foil. Strain liquid through mesh strainer into 4-cup liquid measuring cup. Discard bay leaf and thyme sprig. Transfer vegetables to blender jar. Allow liquid to settle 5 minutes, then skim any fat off surface. Add beef broth as necessary to bring liquid amount to 3 cups. Place liquid in blender with vegetables and blend until smooth, about 2 minutes. Transfer sauce to medium saucepan and bring to simmer over medium heat. 6. While sauce heats, remove twine from roast and slice against grain into ½-inch-thick slices. Transfer meat to large serving platter. Stir chopped thyme, remaining ¼ cup wine, and vinegar into sauce and season to taste with salt and pepper. Spoon half of sauce over meat; pass remaining sauce separately. 7. (For Sugo): Cool and refrigerate the roast and sauce together. The next day using either your hands or two forks, shred the roast in the sauce. Prepare your favorite pappardelle pasta according to the package directions, (or make your own pasta). While the pasta cooks, re-warm the sugo in a sauce pan. When the pasta is al dente, transfer it to the sauce. Finish the pasta in the sauce, tossing it so every noodle is coated. Off the heat, grate parmesan cheese and drizzle some good olive oil over the top.